In my network I already had an access point for WLAN usage in use for a while – although a very cheap model, which did not excel by its high stabiliy and its web interface did not work with Firefox. 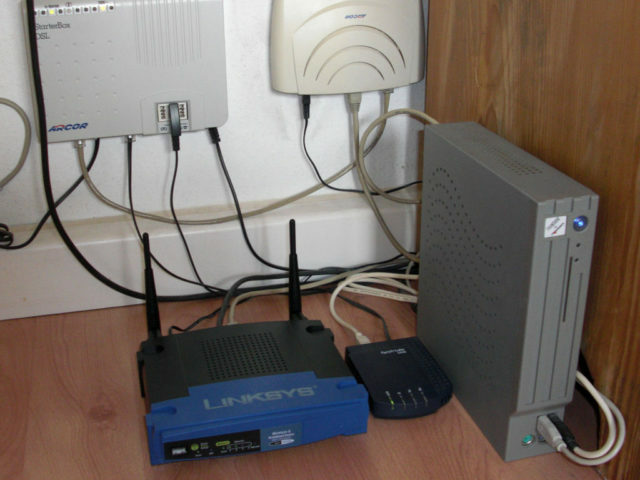 In march 2010 I finally decided to get a Linksys WRT54GL as a relief, which also replaced the the switch by the way – so I now have only one device instead of two. Actually the WRT54GL is a full-featured WLAN router with a 4-port switch – but since FLI4L works quite well and provides other services besides routing, like an answering machine and fax services, the WRT54GL is meanwhile only used as a very comfortable switch and WLAN access point. The WRT54GL is the current version of the WRT54G, which has been on the market for a long time. The device is based on a processor by Broadcom, which is clocked at 200 Mhz and equipped with 4 MB flash ROM and 16 MB RAM. The two antennas are detachable and use TNC plugs. A speciality of this thing is, that the firmware is based on Linux and open source and therefore allows the development of alternatives – so there is already a large number of variants to choose from, like OpenWRT, DD-WRT, FreeWRT, HyperWRT, Tomato and so on. If you can handle a soldering-iron and you are not afraid of loosing any warranty claims, you can also modify the hardware by adding an internal SD card reader or use the internal serial port. After having a look to a number of variants and reading reviews about, i finally choose “Tomato” (see also http://www.polarcloud.com/tomato). 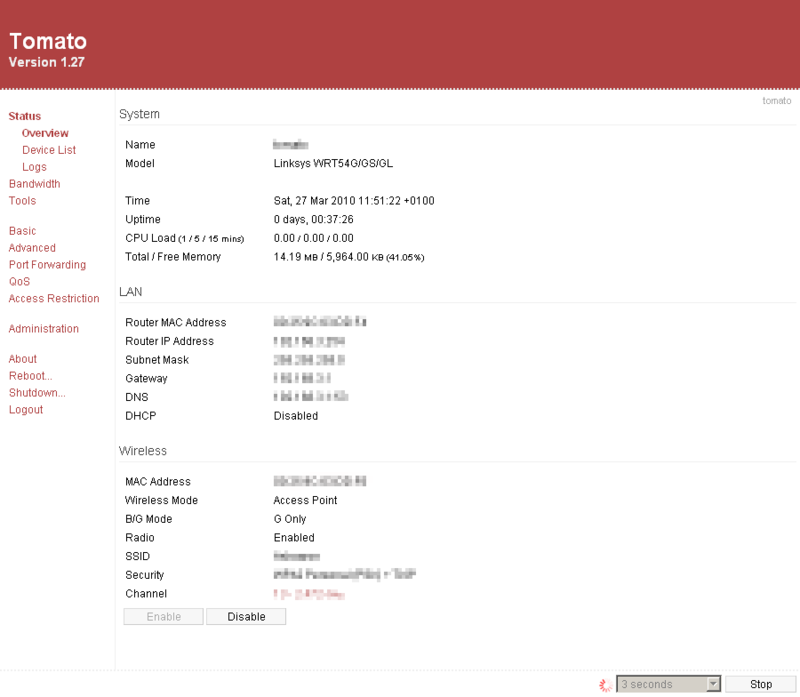 Tomato is not as popular, as DD-WRT or OpenWRT, but qualitative not worse at all – on the contrary: Tomato is based on the original firmware by Linksys and provides a completely reworked web interface and considerable extended functionality. 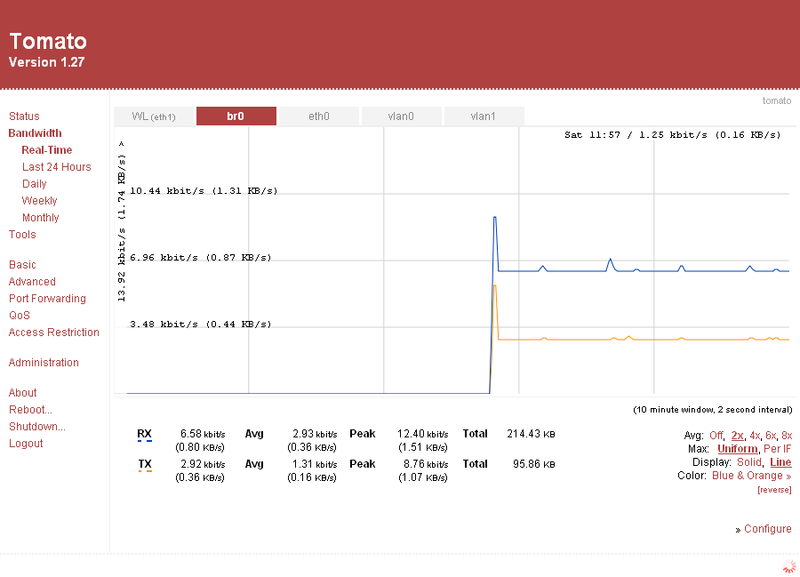 So you get, for example, a telnet- and ssh-server (which can be switched off of course) and a search for active WLANs in the neighbourhood, to find a free channel for your own network. The unused space in the flash ROM can be used for your own data or scripts, if you wish to. 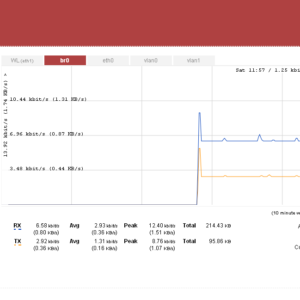 Beside the basic functions of a WLAN router, you also find extensions like the easy integration of custom scripts, a scheduler based on cron to execute tasks regularly, QoS or the automatic update of the system time using a NTP server. What I find particularly felicitous, is the web interface – it is simple and clear and offers very appealing functions, like an animated bandwidth monitoring based on SVG, which works smoothly in newer versions of Firefox.